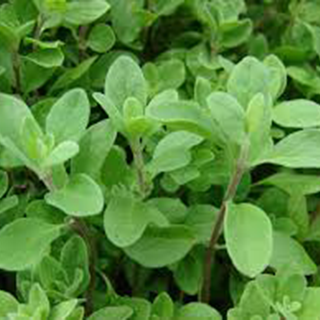 Sweet or Knotted Marjoram is not an annual, but is usually treated as such. Native to Portugal, it will usually not stand the winter elsewhere, so must be sown every year. The medicinal qualities of the oil extracted from Sweet Marjoram - Oleum majoranae - are similar to that of the Wild Marjoram. Marjoram tea is delicious, easy to make, and very calming. Bruise fresh leaves or flowers using a mortar and pestle and add to cold water and boil the tea with the leaves in it. Once the tea reaches a boil turn down the heat and let it steep for at least ten minutes. Drink two cups of this tea over the span of two hours for digestive benefits. Add more leaves or flowers for a stronger taste, the general suggestion is about one teaspoon of the herb for each eight ounces of water (236ml). It has a calming, anti-depressive effect. You can take a marjoram bath or pour a few drops of marjoram essential oil into hot water and breathe in the steam to help treat symptoms of the cold, flu, cough, and sore throat. Marjoram baths are an easy and enjoyable way to relieve pain and treat insomnia or stress, and it is good for your skin too. Take 1-2mls of the tincture three times a day for its anti-inflammatory effects. To relieve sporting injuries, back pain and cramps, mix 7 drops of Marjoram essential oil to 30ml of non-perfumed cream or grapeseed oil and rub in to the area. Seeds may be sown, for an early supply, in March, on a gentle hot-bed and again, in a warm position, in light soil, in the open ground during April. Plants do well if sown in April, though they are long in germinating. It begins to flower in July, when it is cut for use, and obtains its name of Knotted Marjoram from the flowers being collected into roundish close heads like knots. Drying in the shade obtains more aromatic and less broken leaves, with less impurities.